You shop at the Gap. Your mom shops at the Gap. Even President Obama shops at the Gap every now and then. The store’s aesthetic has shifted slightly — we’ve come a long way since the “Mellow Yellow” years — but it’s still full of crowd-pleasing looks for work and the weekend. While the company isn’t shy about offering promotions and discounts, these pro tricks can help you save even more. If you frequently find yourself at the Gap to shop for yourself, your family or even your friends’ new baby, I’ve got you covered. Here are my favorite ways to save money at the Gap. Ever put an item in your online shopping cart, but somehow lose it in the Internet tubes before you get around to buying it? Or the opposite — bought something because it was a great deal, but realized later that you didn’t actually love it? Start using the Gap’s wish list feature. As you add products to your wish list, you can easily share your favorites with family and friends through social media and email. And, if you’re never sure what to say when a relative asks what you want for your birthday, make sure to have your wish list bookmarked and ready. Shopping for yourself? A quick check of your wish list will let you know when a favorite item has gone on sale. But before you buy it, use the rest of these tips to get the best deal. If you’re an Ebates user, you’ll want to be sure to log in before shopping online at Gap. While cash-back rates can vary, they appear to hover between 2 and 4%. You’ll get cash back by shopping Baby Gap and Gap Kids online, and even Canadian Gap.com shoppers can save through Ebates. Ebates also keeps a tally of available promotions and coupon codes, so it’s a good idea to start your shopping there. An item with a sale tag might get marked down again. How do you know whether to wait, or buy right away? Look for the number 7 at the end of the sale price to indicate the final markdown. If you see an amount like $11.97 or $6.97, the piece is on its way out ASAP. A price ending in 7 may also indicate that an item has been discontinued and won’t be produced again — which is pretty routine for clothing stores’ seasonal offerings. Coupon blogger Kyle James told Tulsa NBC station KJRH that Gap lovers should visit local stores every other Monday, as that’s when items are marked down. It may take a little sleuthing to find out which Mondays are magic, but quick visits a few Mondays in a row should do the trick. If you’d rather shop online, James says to always wait until Friday for a new discount code to appear. He also reports recieving a coupon code for Gap.com via Facebook Messenger. If you don’t see a coupon code right away when you visit the homepage, it could be worth taking the time to reach out out via Facebook to make sure you aren’t missing out on a free shipping or other discount. The Gap will refund a portion of your bill if an item you’ve purchased goes on sale within 14 days. But you don’t have to pay full price to get an adjustment — you can enjoy the benefits of this policy even if you’ve purchased an item on sale. Online shoppers can call Gap customer service for their price adjustment. Just remember to check in within two weeks so you don’t miss that price drop! The Gap Visa card has a ridiculously high interest rate: about 25%. If you can’t guarantee that you’ll pay off your balance each month, practice your polite refusal when you’re asked at the register if you want to apply for a Gap card. It’s hard to turn down an extra discount on your purchase by applying for the card, but just thinking about that interest rate could make your stomach turn! But if you’re super-savvy with your credit card, you can layer on the benefits. Gap Card holders receive 10% off at Gap stores each and every Tuesday. You also earn five points for every dollar you spend on your Gap card. 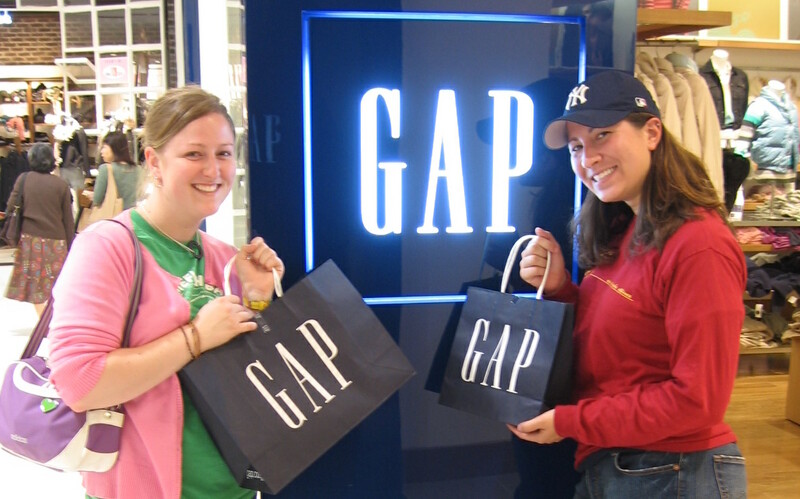 Every time you spend $200 (1000 points), you’ll earn a $10 Reward Card to use at the Gap. You can also earn points at Old Navy and Banana Republic.